What is ‘vector’ geospatial data all about? Present common language to be used throughout the tutorial. “Vector” is a term commonly used in Geographical Information Systems (GIS) to refer to discrete geometric entities (also referred to as objects, primitives, shapes or features) that represent or approximate distinct “things” on the land surface (or the bottom of the sea, or Mars); these entity or object types typically are not used to represent continuously varying fields, rasters or other tessellations. 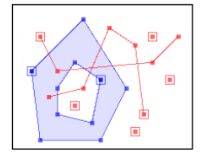 Examples include points and polygons. If you’re coming from the Earth Sciences, be warned that we’re not referring to fields of arrows indicating direction and magnitude (for example, for wind velocity). Other helpful resources on vector data include this Data Carpentry Geospatial Concepts Introduction to Vector Data and this University of Colorado Spatial data open source Python Workshop materials on vector data. The Open Geospatial Consortium (OGC) has defined and standardized a set of geometric objects (plus functions and operators) that are widely adopted in open source and commercial geospatial software. These Simple Features (SF) represent two-dimensional planar geometric objects, as well as other more complex types we won’t address here. Following OGC SF lingo, a feature refers to a spatial entity (any of the above) and encompasses both its geometry and its associated attributes (eg, name, categories, value of some property like population density). A feature collection is then a list or collection of features. Most real-world GIS vector datasets are feature collections. This terminology is widely reflected in Python geospatial software. Also worth noting is that Simple Features also defines optional “Z” elevation values (often referred to as “2.5 dimension” rather than 3 dimension) and “M” measures (typically a distance along a line or trajectory, such as along a road or river). Software support for Z and M has been spotty, but it’s improving. We won’t discuss them in this tutorial. Ok, so a feature collection made up of Multi-Point features is a collection of collections. Gag. You can read the OGC reports to get the terminology completely self-consistent. In addition, the Earth is not flat, nor a sphere, not even a perfect ellipsoid. While latitude and longitude can accurately represent a location on the Earth surface, performing area and distance calculations on an ellipsoid (or spheroid) can be pretty challenging. For this reason, instead of working on this unprojected or geodetic Coordinate Reference System (CRS), one often transforms spatial objects and coordinates into a projected CRS (projecting the curved surface into a cartesian plane), particularly when working at scales that are not global (continental, regional, or highly local). Many types of projections exist, striving to accurately represent area, distance, orientation, or some combination of the three; most are tuned to be most accurate within a specific area of the Earth. It’s critical to know what projection a dataset is in, and to be able to transform between projections as needed to align datasets. Projections are covered in more detail in the Geospatial Data Visualization Tutorial. See also this Data Carpentry Coordinate Reference Systems lesson.